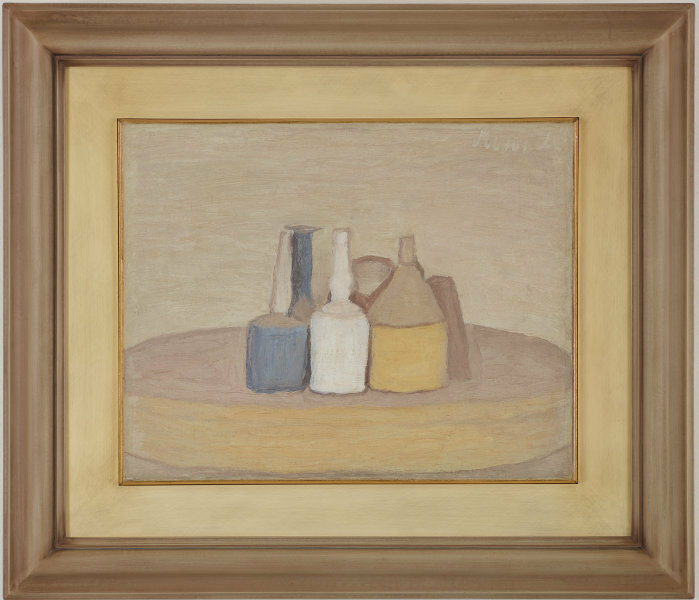 ‘Still life’ 1947 is the third painting by Giorgio Morandi to enter the Gallery’s collection. Painted earlier than our other two paintings (1949 and 1957), and one year before Morandi won the first prize for painting at the 1948 Venice Biennale, one of the major turning points in his career. 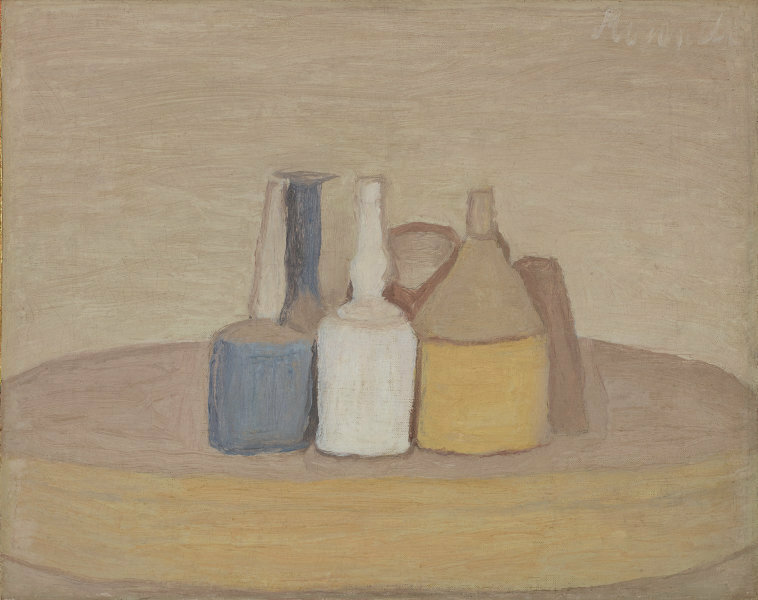 Over the ten year span of these three still-lifes, Morandi remained perfectly consistent in his approach to painting. He was able to make an extraordinary virtue of his self-limitation. What some have construed as a poetics of silence and others as a pathology of withdrawal, Morandi’s contemporaries recognised as qualities of his uprightness and decency: he was one of the few Italian artists of his generation who resisted the taint of fascism. In addition, the narrow compass of Morandi’s art proved wonderfully conductive to concentrating the mind and heightening the senses. ‘Still life’ 1947 has all the hallmarks of classic Morandi paintings because of its quite radical and unrelenting opacity, frontality and symmetry. As a consequence of these qualities, viewers are made acutely conscious of the unity of the image, surface, shape and size of the canvas; they are confronted by the fleshiness of Morandi’s paint. Thus attuned, the altered pressure of Morandi’s touch, slight squirms and tremors in the drag of his brush, infinitesimal shifts in tone and colour are registered as events of exquisite artistry. Signed u.r., white oil paint "Morandi". Not dated. Edmund Capon, Look , 'Our first Hockney... and our third Morandi', pg.12-15, Sydney, Dec 2007-Jan 2008, 15 (colour illus.). Giorgio Morandi: nelle raccolte romane , Rome, 2003, 82-3 (illus.). Modern and contemporary Italian art , Monte-Carlo, 2002, 19 (illus. ).